At the foot of the tomb of Edward VII in St George’s Chapel can be seen the curled up figure of Caesar, a wire-haired fox terrier and the King’s favourite dog. Caesar was Edward VII’s constant companion, following him everywhere and travelling the world with him. His collar read “I am Caesar. I belong to the King”. Such was Edward’s love of his scruffy sidekick that he had Faberge make a trinket of Caesar, which was given to Queen Alexandra. Caesar might not have been popular with everyone, but Edward loved him. On Edward VII’s death in 1910, Caesar is reported to have been heartbroken, barely eating or drinking, searching the rooms for his missing master. The world was moved by photographs of the little dog, accompanied by Edward’s favourite horse, trotting faithfully behind his master through the streets of London in the funeral procession, together at the last as they had always been. Caesar even preceded the crowned heads of Europe, including Kaiser Wilhelm, an insult which it has been claimed helped fuel the animosity which led to the First World War. The monument to Edward VII and Alexandra was unveiled in 1927. 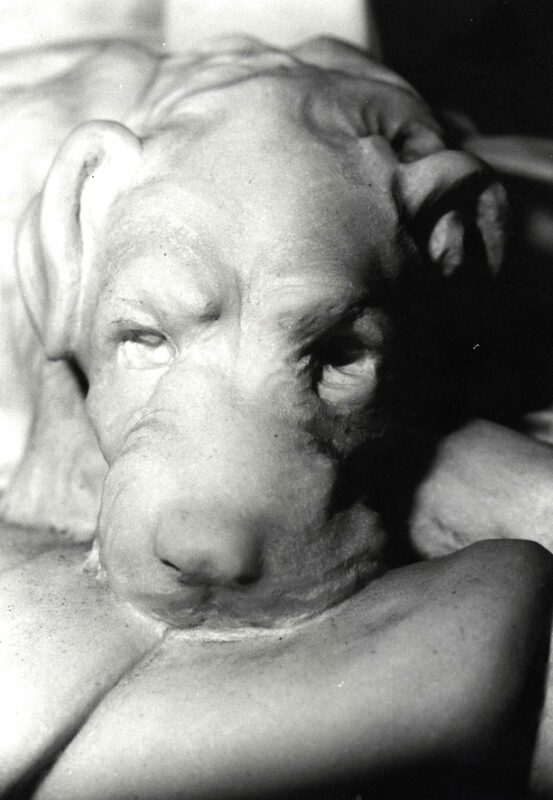 Sculpted by Bertram Mackennal, it shows Caesar back in his rightful place at the feet of his beloved master.